Jeff For Banks: Will "Plain Vanilla" Kill Community Banking? "The positive [fourth quarter] results are attributable to management's common sense and highly focused approach to traditional banking — gathering deposits and making relatively low-risk loans." ﻿I will venture to say I hear and read similar comments so much that it should be considered "conventional wisdom". This line of thinking requires the person promoting it to believe that community financial institutions (FIs) somehow got away from this concept, and by doing so their profits plummeted during the financial collapse of 2008. But if you read or watch interviews of CEOs of community FIs from 2008 forward, you will be bombarded with the message that they didn't engage in the things that led to the collapse. They mostly meant sub-prime residential mortgage lending. I would contend that this statement is true. Community FIs, in general, did not make loans to those with little wherewithal to repay them. So how did they get away from "plain vanilla" banking? I don't think Community FIs departed from their business model at all during the crisis. Perhaps, one can argue, that because of the recession and the decline in credit quality FIs have been playing defense, and getting back to "plain vanilla" banking means beginning to play offense. But the notion that FIs got away from this model is, in my opinion, bunk. They have been using that model for decades. Is the premise that doing "plain vanilla" banking acceptable? Valley National had an ROA in the fourth quarter of 1.08%. Pretty good by today's standards. So will continuing to operate "as is" work infinitum? I doubt it. Customer preferences are changing more rapidly than bankers are willing to change their business models, in my opinion. FIs are not like speed boats, where the driver can change course on a dime. It's more like the Titanic heading into an iceberg. You can't flip a switch on a "plain vanilla" bank model, and turn yourself into something different. This requires bankers to look into the future to determine the course of customer preferences and where they can gain a competitive advantage. If banking changed at the pace of technology, we would be out of business. Take Apple, Inc., for example. Sometime in the mid to late 1990's, a clairvoyant leader at Apple thought that Mac sales would not drive this company forward. So they strategized. They determined where computing was going. They widened their strategic thinking to the world of multi-media and telecommunications. Where could they make a difference, be a first mover, corner a market? 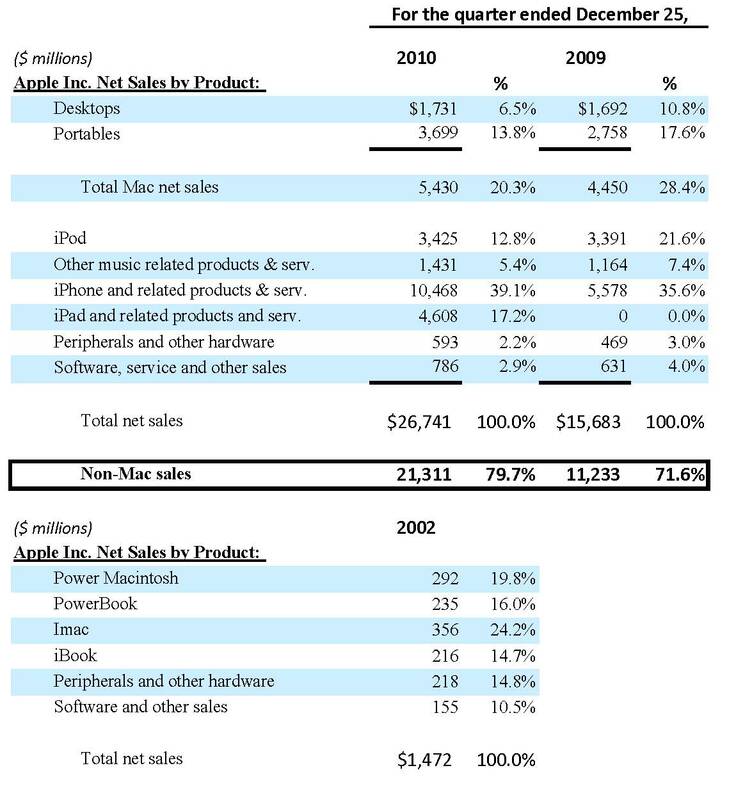 Below are tables indicating the significant change in revenue sources at Apple over the past eight years. 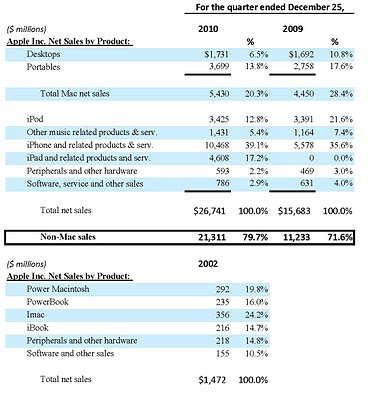 In 2010, Mac-related sales represented a paltry 20% of total sales. What if Apple stuck with "plain vanilla" desktop computing. They would probably be out of business. They made a strategic bets on iPods and music (now representing 18% of total revenue), iPhones (now representing 39% of total revenue), and the up and coming iPad (now representing 17% of total revenue). Naysayers will point out that FIs are not tech companies, and it's a fair point. But what about Bank of New York Mellon. Below is their segment reporting from 2001 and 2010. They changed categories, but it is clear that this Bank moved away from traditional banking and determined that the best chance for success was in asset/wealth management and securities processing. A similar argument could be made for the former Commerce Bank of Cherry Hill, New Jersey. Many scoffed at the business model of rapidly erecting high-cost/high-profile branches to pursue a targeted retail strategy. They point to Commerce's demise, having to sell to TD Bank to get out from under regulator scrutiny. But it wasn't the business model that failed, it was their executives. The business model flourished, taking market share in bucketloads from "plain vanilla" FIs. The "plain vanilla" model still has legs. But how much longer can these FIs continue to do what they have always done? I frequently hear "customer service" touted as a point of differentiation, but fail to see how one bank's service is better than another. I also hear "relationships", but note that very large FIs build relationships too. And if a community FIs' relationships are so strong, how come customers will walk for minor rate variations? In my opinion those that follow "plain vanilla" without making the strategic moves to remain relevant will march all the way to the cliff. Sure, those business owners are used to doing business a certain way and have predictable expectations from their FI. Those "seasoned" customers that hold a lot of the wealth and therefore the deposits also have predictable expectations. But what about the next generation business owner and depositor. Will they expect the same? I doubt it. They all have iPhones and iPads. What will your strategic bet be?